The Yankees have been without flame throwing closer Aroldis Chapman since May 14th when he was placed on the Disabled List with inflammation in the rotator cuff of his left shoulder. Brian Cashman announced at the time that Chapman would likely be out around a month. In Chapman's absence Dellin Betances has taken over as the closer and other roles in the bullpen have had to be juggled as well. In just a matter of days however, the Yankees bullpen may be returning to normal. 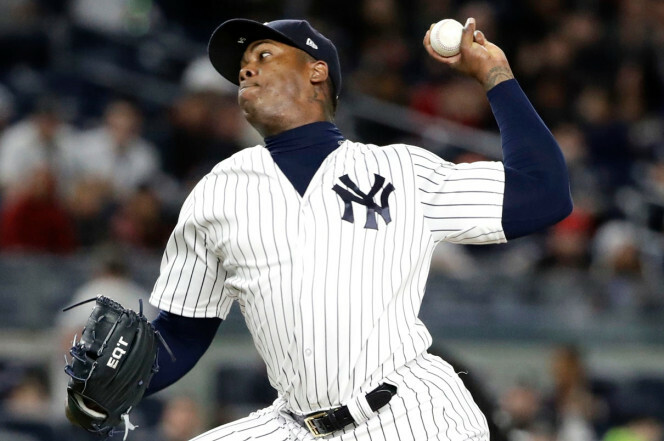 The Yankees announced Friday afternoon that Chapman was heading to Tampa and will throw a simulated relief outing on Saturday. Chapman told reporters Tuesday night that as long as there were no setbacks he would likely head out for a minor league rehab assignment following the simulated outing. The Yankees' goal is for Chapman to return to the team next Friday June 16th in Oakland. For the season, the Yankees 29 year old closer has a 3.55 ERA with seven saves and 21 strikeouts in 12.2 IP.